Hark! The Herald Angels Sing, Glory be to this Museee-um! As I begin to write up this page I a little bit bothered by something. It’s stupid, and no one will care, but I can’t help it. 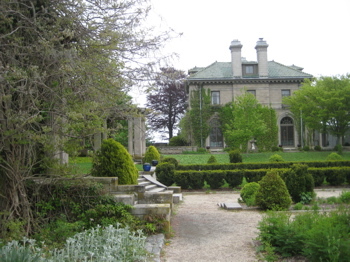 You see, when I visited the Harkness Mansion I had to make a Sophie’s Choice: Spend extra time in the historic Beatrix Farrand garden or check out the other big building on the property. I chose the garden. Actually, I didn’t really have a choice. I missed the first tour of the event (I was down there for the annual CT Forest and Parks Association meeting) which went to the other building and took a subsequent tour that focused on the gardens. But I can’t complain; after all, once the meeting started I hung back and got a personalized tour of the mansion when everyone else went to go hear the new DEP commissioner speak. Even thought they don’t call it Eolia anymore, I like it and I will call it that. I think it’s a really cool name for a mansion. Eolia is named for the island home of the Greek god of winds and it’s apt; as the spit of land that juts out into Long Island Sound is always windy. 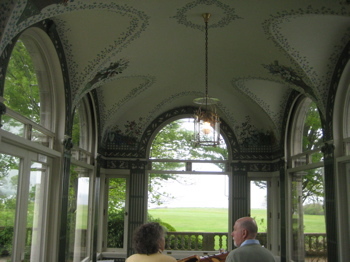 And the tours are offered by the volunteer force of the Friends of Harkness. And they are a lovely lot of (usually, it appeared to me) older women with a fondness for hundred-year old excess. The Roman Renaissance Revival-style mansion has 42 rooms and was designed by the architectural firm of Lord & Hewlett. The mansion was built in 1906 and purchased by Edward and Mary Harkness in 1907. 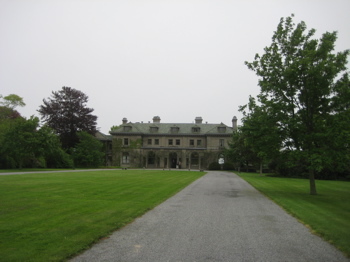 The 200+ acres were a working farm and the Mansion was the Harkness’ summer home. That’s right, this monstrosity was their SUMMER home! They only lived here from the end of May until early September or so! Mr. Harkness, whom we’ll meet in a second, was a Yalie who enjoyed the annual Yale-Harvard regatta. So that was his annual alarm to get up to Connecticut in order to see that event. (An event which is the oldest intercollegiate sporting event in the US). 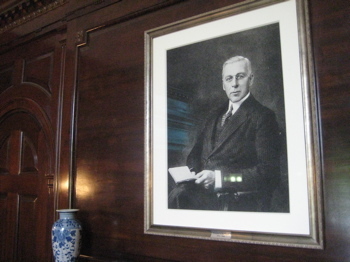 Originally from Ohio, Edward S. Harkness was to become heir to a fortune initiated by his father’s substantial investments in John D. Rockefeller’s Standard Oil. His father was a harness maker who had some success, and he just happened to know someone who told him about this Rockefeller character well before he made his loot. So he got lucky (really lucky). Instilled at an early age with an ardent love for his fellow man and a feeling of responsibility for the wise and just use of the wealth at his command, Mr. Harkness was to bestow over two hundred million dollars upon wide-ranging philanthropies. His extensive philanthropies, many of them anonymous, were extended especially to colleges, hospitals and museums – hey, I knew I liked this guy! Through her will, Mary Harkness in 1952 deeded the portion now known as Camp Harkness to the State of Connecticut for perpetual use by those stricken with polio, “handicaps”, and veterans. And they didn’t commission this giant place, the bought it from someone else. The mansion was purchased in 1907 by Edward and Mary Harkness. 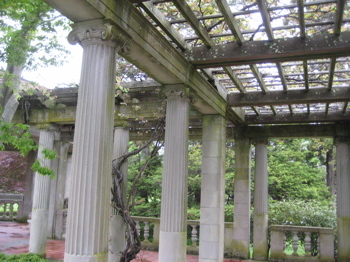 From 1918 to 1929, extensive work was done to the grounds by noted landscape designer Beatrix Jones Farrand (one of the founders of the American Society of Landscape Architects). The Roman Renaissance Revival-style mansion has 42 rooms and was designed by the architectural firm of Lord & Hewlett. Starting in 1909, architect James Gambel Rogers designed interior renovations (Classical Revival style), the pergola (tearoom) and carriage house (support complex – the building I didn’t get to see inside). During this time, Rogers was also involved in the layout of the west garden with the firm of Brett & Hall. 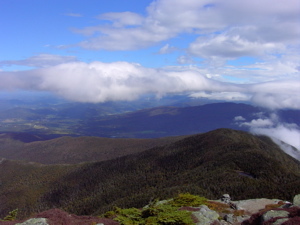 The estate was left to the State of Connecticut in 1950 and became part of the State Park system in 1952. And we’re all the better for it. After our tour of the gardens, we were shown the carriage house from the driveway. It’s huge and allowed for many guests to stay as well. It has a bowling alley and a squash court and everything. It also has this cool thing where the limos would drive in the garage and then a wheel on the floor would turn it around to face outward again. I want one of those. After that, we entered the mansion proper again and began that tour. It’s a lovely house to say the least. Reconstruction of the Loggias and exterior masonry serves as an example of careful preservation. The original roof structure of both Loggias was shored up and repaired, the masonry replaced underneath without destroying the ceilings. 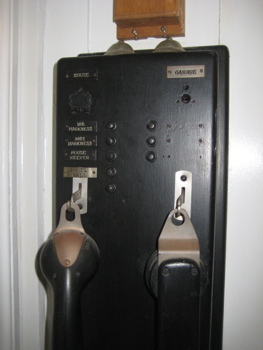 The plumbing system was restored utilizing the original fixtures. The walls in the east court were rebuilt entirely with new foundations. The chandeliers in the Mansion were restored and rehung in the positions shown in early photographs. Paintwork throughout the Mansion was stripped and repainted to the original colors. 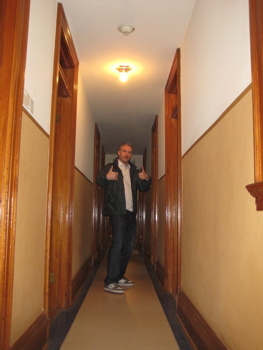 The floors were refinished, utilizing new linoleum to replicate the original. 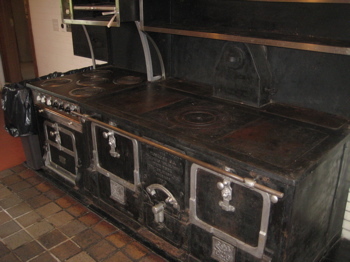 The original interior finishes and kitchen tiles were retained and repaired. It was, quite obviously, a big project. And from my point of view (that of a non-expert in early 20th century wealth), it all looked very authentic to me. We wandered through the sitting room and the dining room (note the ebony sconces! Whatever that means). The loggias were really beautiful and the varying views of the gardens, lawns and Long Island Sound were breathtaking. 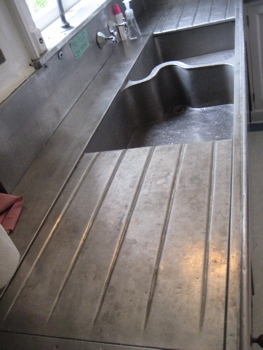 I also loved the Monel Metal sink. Monel metal is a nickel-copper alloy that is incredibly resistant to corrosion. It was used for planes and rockets and apparently sinks for the super rich. Oddly, it scratches really easily. A couple rooms of note here are the cold room and the cutting room. The cold room was a Rogers invention (if I heard correctly) that was just what it sounds like. Kept a constant 42 degrees, this was rather revolutionary at the time. The cutting room was a way-too-large room solely for the purpose of cutting the flowers for the arrangements around the mansion. You’re not rich until you have a cutting room. Upstairs, we viewed the servants’ quarters (of which there were a lot.) 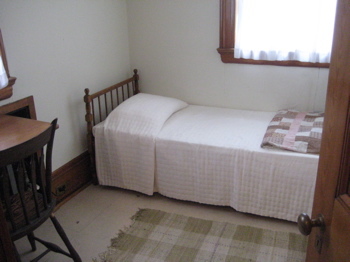 Our guide said that the furniture in these modest rooms were Hitchcock chairs, which is pretty unbelievable. (CTMQ’s “visit” to the defunct Hitchcock Museum). At the end of the hallway now back above the large rooms on the ground floor, we checked out Mr. and Mrs. Harkness’s bedrooms. 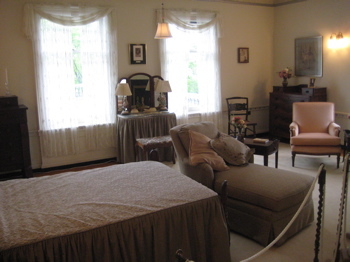 That’s right, for whatever reason people 100 years ago really did keep separate bedrooms. 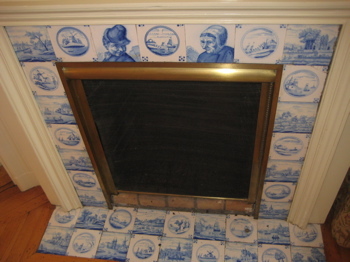 There was nothing remarkable here other than perhaps the tile from Holland around Mr. Harkness’s fireplace. I imagine the large majority of people who come to Harkness come to have a picnic and never actually tour the mansion. A picnic on the grounds and a stroll through the garden is certainly a worthy venture, but the mansion is pretty darn cool. And knowing how giving and caring the Harkness’s were makes it one hundred times better. I would like to arrange a tour for 8 senior citizens. Fantastic! I’d suggest contacting the folks at Harkness. Have fun!